Ever since human-caused climate change emerged into public consciousness around the late 1980s, news stories and public awareness campaigns surrounding the topic have predominantly been accompanied by images of polar bears and melting ice, reinforcing common misconceptions that the impacts are far away in space and time and removed from our daily lives. Read the entire article at Scientific American. The frequency, intensity, and duration of heatwaves, droughts, wildfires, floods and storms are increasing due to climate change. As average temperatures continue to rise, so will heat-related disorders. Climate change exacerbates air pollution. Elevated carbon dioxide (CO2) concentrations are associated with decreased human cognitive performance. 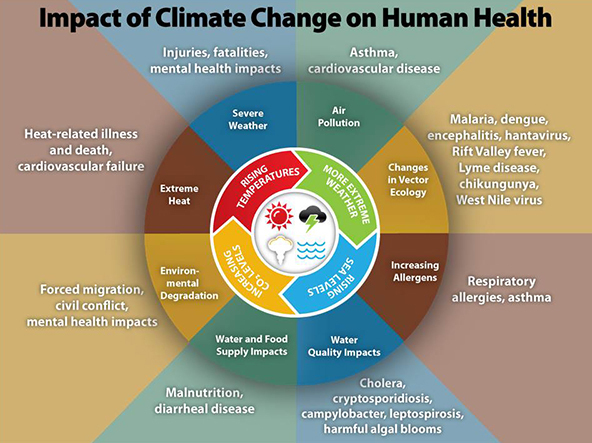 Climate change influences the transmission of vector-, food-, and water-borne diseases. Climate change threatens food and nutrition security. Climate change will cause mass migration and most likely increase collective violence. Climate change poses threats to our mental health and well-being.